Download a summary of the tasks, options, and approaches associated with synthesising data from one or more evaluations. Bringing together data into an overall conclusion and judgement is important for individual evaluations and also when summarising evidence from multiple evaluations. 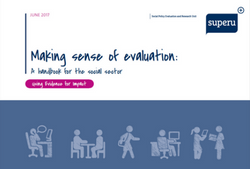 I'm interested in how to analyse and synthesise data during the evaluation process. It seems that these links don't work - the "Synthesise data from a single evaluation" would be particularly helpful for our project. Thanks for letting us know. I've just updated and checked the links - please let me know if you have any further trouble. You can also find the full list of task pages on our Rainbow Framework Overview Page.